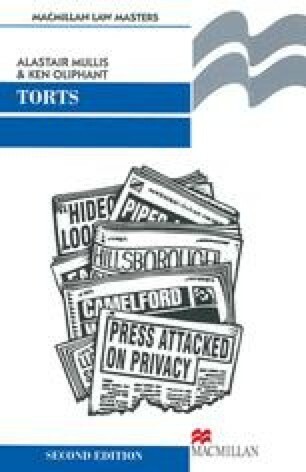 Having considered the tort of negligence, we begin now our discussion of the remaining torts that feature on the typical tort syllabus. As we stated above, these are to be grouped according to the interests they may be said primarily to protect (see 1.3). Here we deal with torts that protect against interference with the person and personal property. Subsequent parts of the book deal with interest in land (Part III) and interests in reputation and privacy (Part IV). In each of these areas, we consider the impact made by the tort of negligence and the distinctive contribution made by other tortious causes of action.